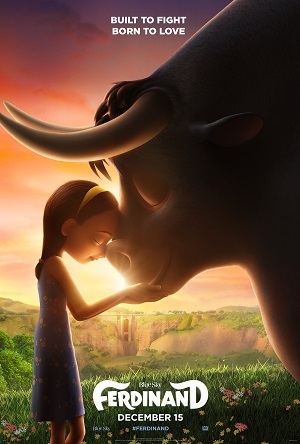 After escaping the Spanish bull ranch Casa del Toro as a youngster, Ferdinand (voiced by John Cena) is raised into adulthood by the kind and loving Nina (Lily Day), the daughter of a flower farmer who treats the massive, gigantic animal as a member of the family. A pacifist at heart, the large bull inadvertently destroys a small town’s springtime festival after an unfortunate encounter with a bee. Mistaking him for a dangerous brute who must be properly trained, Ferdinand is unceremoniously sent back to the Casa del Toro, the bulls living there not understanding why one of their brethren would rather sniff flowers than be selected to fight inside the Madrid coliseum against a bloodthirsty matador. I have fond memories of reading Munro Leaf and Robert Lawson’s timeless 1936 children’s book Ferdinand the Bull as a youngster. I have equally wondrous ones of discovering Disney’s Oscar-winning 1938 animated adaptation, this classic entertainment appearing on television so often during my childhood by the time I was a teenager I likely knew every frame of the eight-minute short by heart. It’s a simple, subtle and undeniably wondrous narrative, this astutely elegant tale of love, acceptance and peace one that is all but guaranteed to continue to stand the test of time with steadfast ease. With a story and a script credited to six different writers, director Carlos Saldanha’s (Ice Age, Rio) energetic adaptation of Ferdinand unsurprisingly doesn’t deserve to be inside the same bullfighting ring with any of its predecessors. Even so, the film gets just enough right to hardly be a disaster, and while I wasn’t nearly as satisfied with this one as I hoped I would be, I can’t say the filmmakers stumble over themselves to the point where their missteps cannot be forgiven. No, for young children, the energetic vitality of the motion picture coupled with its delicate story of nonviolence and standing up against bullying is one to be treasured, and even if I didn’t love it I won’t hold it against any viewer under the age of eight or so who do. The reality is that, whenever this version sticks to the source material, walks directly in the steps of Leaf and Lawson’s book without varying outside of them, Saldanha’s take is wondrous. But there’s a reason the Disney version came in under ten minutes in length, the amount of filler required to get this story up to feature length rather extraordinary. New additions like a talkative goat named Lupe (an unexpectedly annoying Kate McKinnon) and a trio of secretive hedgehogs (Gina Rodriguez, Daveed Diggs, Gabriel Iglesias) don’t bring anything substantive to the table, while the less said about the stunt casting of Peyton Manning as one of Ferdinand’s rival bulls at the Casa del Toro the better it would likely be for all involved. There is an obnoxious subplot concerning three German show ponies (Flula Borg, Sally Phillips, Boris Kodjoe) that’s fairly unfortunate, and for the life of me why so many of these second-tier animated movies always seem to insert chaos and destruction into the mix for no discernible reason whatsoever thinking that is what audiences wants to see is way beyond me. But Cena gives a lovably touching vocal performance as the title character, and many of the early scenes between Nina and Ferdinand are suitably heartwarming. I also respect the fact that the filmmakers didn’t fall prey to the easy out of having the heroic bull fight once he gets into the ring against the matador. Instead, sticking to the source material, it is the fact the he refuses to fight yet still treats his opponent with appreciative respect that the crowd is won over by the animal, the themes of Leaf and Lawson’s book coming through with rapturous clarity. Not that this Ferdinand was for me. It’s too obnoxious, too self-involved, the hyperactive antics of pretty much every member of the supporting cast driving me bonkers. Coming so soon after the respectful cultural elegance of Pixar’s Coco, a story that celebrated Mexico in a way that felt authentic and pure no matter what my reservations might have been with the film as a whole, this one can’t also help but feel moderately insensitive, the Spanish flavor that could have made this adaptation sing sadly missing for the majority of the picture. I’m just not bullish on it, the finished product a minor disappointment I cannot imagine I will ever purposefully watch again.